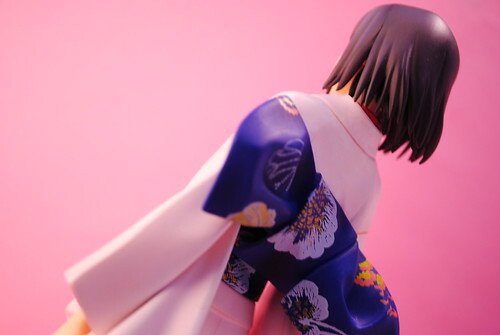 Since I got a fancy DSRL now I been wanting to re-shoot couple of my figures. On top of the list is the subject of my first photo shoot ever. If your are interested you can take a look at my first embarrassing photo shoot. Man I can't believe I ended using that obviously badly white balanced photo. The main reason why I wanted to this was simply because I believe my initial shoot didn't capture all of the elegant detail in this figure. 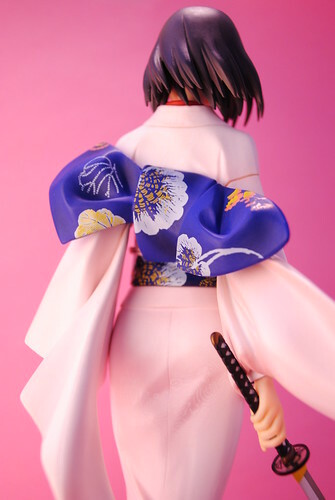 Details such as the pattern on Shiki's kimono. Shiki was my first GSC figure and the first imported PVC figure I bought ever since Alter's original V1 Kos-Mos. I always wondered why people always held high opinions GSC. 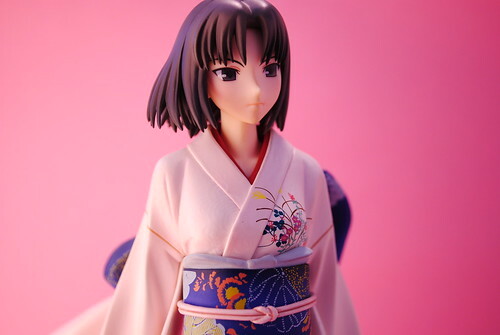 Looking at Shiki's details in her kimono, obi and the excellent face painting I began to understand why people held these opinions. 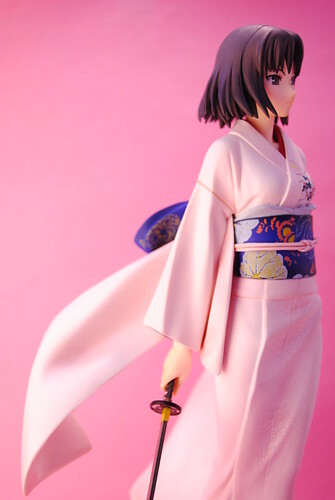 I really like this figure, I bought it knowing nothing about Shiki. I'm the kind of person who prefers to buy figures of characters I know. 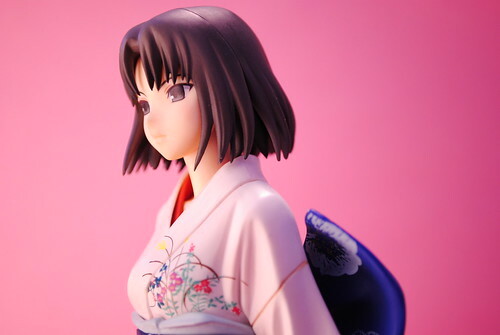 I have watched more of the Kara no Kyoukai movies since then, man Shiki is so awesome. I'm so glad I bought this figure and ended watching the movie adaptations. As far as the figure itself I'm still quite pleased with the sculpture and paint work. One thing I really like about the figures released by GSC is the accuracy of the face sculpture. I have owned this figure for a little more than a year already. I read about some slight leaning problems, so far I haven't noticed anything of the sort. 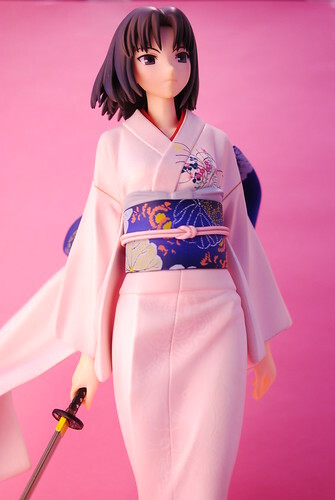 Shiki still looks as good as she did when I received her. Another thing I loved about this figure was the price. 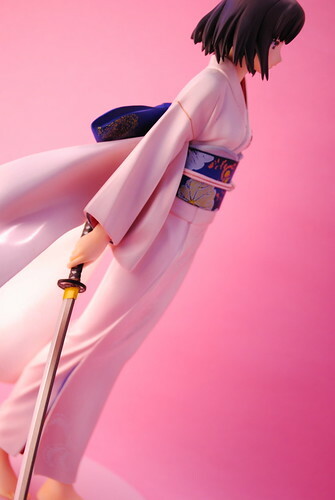 I acquired this figure from Hobby Search for about 5800 yen. 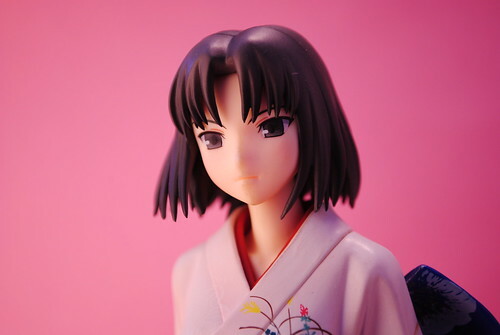 My last 1/7th scaled figure cost me 10,000+ yen. I miss the days when it was only Alter's releases that where in the 7000+ yen range. Enough ranting on my part, you can take a look at the rest of the pictures heading over to my the flickr set. By the way who do you prefer for my next figure post?